Even if you can’t take an impromptu trip, here’s how you can truly show up for someone. There’s something special about having a friend show up to support you in an unexpected way — which is exactly what Meghan Markle did last night at the British Fashion Awards. The Duchess of Sussex made a surprise appearance at the event to personally present the British Designer Womenswear Award to Givenchy stylist and close friend, Clare Waight Keller. 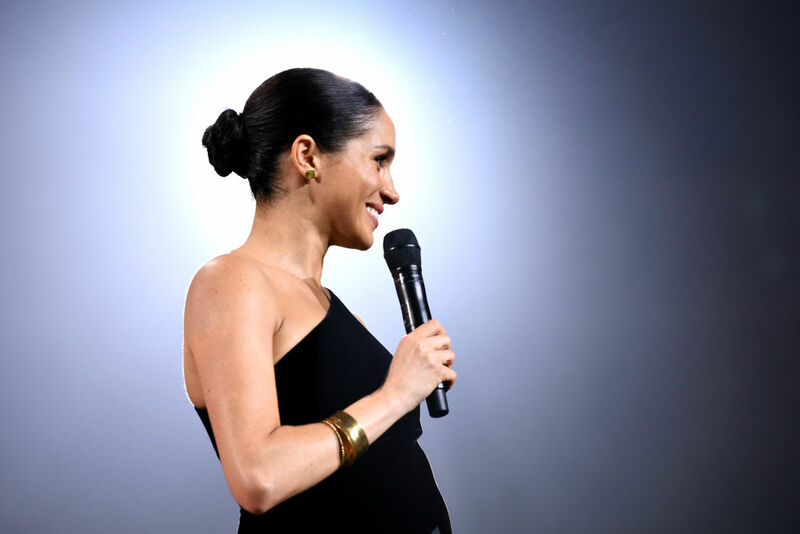 Markle first met the British designer only 11 months ago, and their friendship quickly flourished while Keller designed Markle’s wedding dress. Most royal appearances are planned and publicized weeks in advance, but the Duchess’ surprise onstage-appearance was kept a complete secret — a heartfelt, thoughtful act to show up for a good friend on her special night. “I can’t even tell you how surprised I am,” Keller exclaimed on stage, hugging Markle. “To have someone like that trust you in an incredible moment in their life is something that is just the most unbelievable honor, and I can’t thank you enough,” she said. In an age of endless scrolling, liking, and texting, a handwritten note is a sincere, thoughtful way to tell your friend that you’re thinking of them, says Hubbard. “If you know your friend has a big interview coming up, or is feeling stressed about a family issue, send them a handwritten letter that shows they’re on your mind,” she says. If you have the luxury of living in the same city, offer to go on a walk with your friend when you know they’re struggling with something at home. “There’s something special about physically being present, even if you’re just going on a walk around the block for some fresh air,” Hubbard notes. Even better if you’re immersing yourselves in nature, like a hike in the woods or a walk near a body of water. Leave the devices at home, enjoy the calming effects of being outdoors, and just be therefor your friend, to talk or to listen. “If you know your friend loves dark chocolate, send them a bar of their favorite brand to let them know you’re thinking of them,” Hubbard suggests. By acknowledging your friend’s interests and sending them a little something they love, you’re extending a thoughtful gesture, even if you can’t be there physically. Attach a brief note with your treat. A “thinking of you” or, “thought you’d enjoy this” can go a long way. If you know your friend has a stressful meeting or presentation, Venmo them a few dollars for a fancy latte, or send a sweet “good morning” text just to say hello. It can be easy to get wrapped up in the social anxieties and comparison traps that come with our devices, but there are also great ways to use technology to show up for a friend. Engaging in a consistent ritual is one of the best ways to show up for a friend, says Hubbard — so consider starting a meaningful new tradition together. Whether you plan a weekend getaway together every summer or send a funny gag gift each year on their birthday, it’s never too late to start a new ritual that you can look forward to every year.